The act of explaining can help students to develop new understandings of mathematical ideas, construct rules for solving problems, become aware of misunderstandings or a lack of understanding and develop their mathematical communication. Their explanations can also offer opportunities for a teacher to understand more fully what the students are thinking. Yet, previous research has focused mainly on tasks, questions and other teacher actions that prompt student explanations and on generalising what counts as an explanation. Using a conversation analytic approach, transcripts of mathematics lessons from different schools and different teachers were analysed, looking specifically at the interactions where students gave explanations. This paper describes two interactional contexts where students gave explanations without being explicitly asked for one by the teacher. The structures and content of the interactions in which these student explanations occur reveal further ways in which teachers can encourage students to offer explanations beyond asking how or why questions. We suggest that awareness of the underlying structures of interactions is likely to leave the teacher better equipped to exploit such situations as they arise in their classrooms. Explanations are one of the most prevalent discursive practices in mathematics classrooms. Students can offer explanations to demonstrate that they understand something, to persuade others, or to help them to clarify their own thinking. They may arise when answering a teacher’s question, when expanding on something, when seeking help, or when justifying answers to problems. Yet, explanations do more than communicate reasoning. Explaining also helps students to grasp principles, to construct rules for solving problems and become aware of misunderstandings or a lack of understanding (Chi, Bassok, Lewis, Reimann, & Glaser, 1989) as well as to develop new understandings of mathematical ideas (Rogoff, 1991). At the same time, students’ explanations can also offer opportunities for a teacher to understand more fully what the students are thinking. Consequently, teachers can then respond specifically to this thinking and adapt their teaching by making more informed decisions about what to do next. As the explanations considered in this paper are also given publicly, they give other students the opportunity to connect with and possibly adapt their own understanding too. As well as serving mathematical learning goals, explanations also afford the accomplishment of linguistic goals (Moschkovich, 2015). By offering students opportunities to explain, teachers are supporting their students to communicate mathematically and to develop their mathematical communication. If we take learning mathematics to be both the acquisition of new knowledge and skills, and increased participation in a discourse community (Leinhardt, 2001; Sfard, 2012) then in order for students to learn the discourse of mathematics, they need practice in using the discourse, not just experiences of listening to the discourse (Mercer, Dawes, & Staarman, 2009). Explaining provides students with such opportunities to use mathematical terminology in a meaningful way, an important stage in becoming part of the mathematics discourse community. Continuing to offer such opportunities makes it more likely that over time students will learn to express the concept they are trying to relay with greater clarity. In this article, we take a conversation analytic (CA) approach to examine the sequences of interaction in which a student explanation occurs. We specifically address what makes a student explanation conditionally relevant during whole class interactions in mathematics lessons. By conditionally relevant, we are referencing the interactional contexts that students treat as requiring an explanation. This represents a shift in focus in comparison to other research analysing classroom interaction, which has focused on how teachers respond to and support students developing their explanations in the turn that follows (Franke et al., 2009) and on categorising the types of explanations that students offer (Drageset, 2015). In doing this, we are offering additional ways in which a teacher can generate the need for an explanation from their students, without explicitly asking for one. In this section, we explore the literature and research relating to explanations within the mathematics classroom. We briefly address the question of when student explanations occur during classroom interaction, before examining the issues around both defining and categorising explanations. Consideration is also given to the implications for teachers who are seeking to promote student explanations in their classroom. Through this review, we see that the majority of studies into classroom explanations have used researchers’ constructs of what counts as an explanation, rather than what teachers and students treat as explanations in the classroom, and redressing this provides motivation for the methodological approach adopted in the current study. 2.1 When do student explanations occur? One of the challenges of examining student explanations is identifying what counts as an (mathematical) explanation. The terms student explanation and mathematical explanation are widely used in both the research literature and the professional literature written with teachers in mind, but how they are defined and used varies considerably. Below, we will examine how this literature characterises the qualities of student explanations, but first we focus on definitions based on when such explanations occur. Many authors focus specifically on the linguistic features of the interaction. For example, Bailey, Blackstock-Bernstein, and Heritage (2015) consider student explanations as turns given in response to how or why questions. Similarly, Resnik and Kushner (1987) argue that what counts as an explanation is dependent upon the why question to which it is responding. Pimm (2014) also connects explanations to why questions and highlights that explanations “prototypically might begin ‘because’” (p. 971) but questions whether linguistic markers such as because, so and therefore are “necessary for something to be seen as or identified as an explanation” (p. 972). As Leinhardt (2001) points out, explanations do not usually have clear linguistic markers (p. 344). Whilst many student explanations may follow a teacher’s why or how question, not all do. And whilst many student explanations will include connectives such as because or so, not all do. Furthermore, answers to why questions or utterances that include the word because may not be considered to be explanations by either researchers or teachers, e.g. a student answer of “because it is”. We conclude that simple linguistic features are neither necessary nor sufficient in order to identify what counts as a mathematical student explanation. 2.2 What counts as a mathematical explanation? Characterising mathematical explanations raises even further issues, since students can use a variety of explanation types in mathematics classrooms, and these may serve different purposes. Explanation can refer to causal processes in which the student offers an account for a response. But other explanations feature a logical process of mathematical reasoning constituting a mathematical justification for a response. The question then arises as to what a mathematical explanation is in contrast to other explanations that might arise in a mathematics lesson. Levenson, Tirosh, and Tsamir (2009) consider explanations to be mathematically based when they use mathematical definitions, use mathematical properties, or use mathematical reasoning, but importantly they describe a continuum of explanations rather than a categorisation, with practically based explanations that draw upon context or resources towards one end and mathematically based explanations towards the other end. We explore the characteristics of explanations on this continuum here. Yackel and Cobb (1996) make a distinction between explanations that describe procedures and those that describe actions on mathematical objects. Similarly, Perry (2000) distinguishes between explanations that describe how to do something and those that describe why to do something, yet these distinctions are not necessarily easily made in practice. This is particularly the case in situations when the explanation accounts for an action. For example, available explanations for why the solution to the equation 4x = x + 6 is x = 2 include the particular case of how (subtract x from both sides, then divide both sides by 3). But the apparently more general explanation of why – “because we are looking for a value of x so that the expressions on each side are equal” – could be interpreted as a general statement of a method for solving by substitution – “because we are looking for a value of x so that the expressions on each side are equal and 4 times 2 equals 2 add 6” – and could thus be treated as an explanation of how the equation might be solved rather than as an explanation of why x = 2 is a solution. Broadening analysis to the linguistic context in which the explanation arises, fails to make a clear distinction either. For whilst explanations that describe procedures generally follow how questions, responses to why questions include both explanations that describe procedures as well as explanations that draw upon mathematical properties or relationships (Ingram, Andrews, & Pitt, 2016), as can be seen in the example equations above. Distinctions are also made in the literature between proof, argumentation and explanation. A number of researchers have observed that students are more likely to accept a proof in mathematics if it also explains (e.g. Sinclair, Healy, & Sales, 2009; Healy & Hoyles, 2000) and research into what it means for a proof to explain (e.g. Stylianides, Sandefur, & Watson, 2016) emphasises that the two are not synonymous. In short, whether a proof is explanatory or not is subjective. Studies have examined the criteria students use when accepting a proof as an explanation or not, with proofs including a narrative, deductive reasoning or the possibility to be understood in a variety of ways being more often accepted as an explanation than for example visual proofs (Healy & Hoyles, 2000). Krummheuer (2007) and his colleagues have focused their analysis on a particular type of explanation, argumentation, which draws on Toulmin’s scheme of argumentation and can lead to the structuring of proof (Simpson, 2015). The focus here is on the elements of the emerging argument, which broadly can include backings and warrants. Within this area of research, we again see the focus on the structure of an explanation as a way of categorising something as an explanation, but also an appreciation that what counts as explanatory is again a subjective decision. In this section, we have seen that attempts within the literature to characterise student explanations based upon their mathematical properties are contested. Another perspective is to consider the purposes of explanations. In ordinary conversation, explanations can offer support for a claim that is being made, they can be used to persuade the listener (Antaki, 1985), or they can provide an account for something (Resnik & Kushner, 1987). In classrooms, explanations are usually given for two main reasons, to help someone else understand or to demonstrate understanding (Donaldson, 1986). Hill, Charalambous, and Kraft (2012) focus on the purpose of an explanation, defining mathematical explanations as “giving mathematical meaning to ideas, procedures, steps, or solution methods” (2012, p. 63). This marks a shift in focus to what explanations are doing in mathematics classroom interactions. From this new perspective, mathematical explanations are therefore situated within the context in which they occur. This fits with the interactional approach adopted in this article where an explanation is an explanation if the teacher and/or students treat it as such in the sequence of interaction. As such, whether an explanation is mathematical or not depends upon the sociomathematical norms negotiated by the class. These are established through the explanations modelled by the teacher, used and accepted by students, and through how explanations are evaluated by the teacher (Yackel & Cobb, 1996). Our intention in this paper is not to define what is meant by an explanation, but rather to find those interactional contexts where students and teachers treat turns as explanations. It is for this reason that we adopt a CA approach and seek to identify interactional contexts where the students treat an explanation as being conditionally relevant even though the teacher has not explicitly asked for an explanation. There has been considerable research into how teachers can support students to construct and improve their explanations. Possibly most well-known is Bauersfeld’s notion of funnelling and focusing sequences of questions. Funnelling sequences close down the direction and content of the explanation to a specific answer, with the majority of the mathematical work being done by the teacher. Focusing sequences of questions on the other hand encourage students to do the mathematical work by focusing attention on particular aspects of the students’ explanations (Wood, 1994). Forman, Mccormick, and Donato (1997) describe a teacher who fostered student explanations in a variety of ways and in their study, student explanations usually involved demonstrations of the problem-solving process or the rationale behind the problem solution. Similarly, Erath (2016) identified three ways in which teachers can give opportunities and support for students to give mathematical explanations, distinguishing between support that enables the student to construct an explanation in the immediate interactional context and support which serves to establish or maintain a mathematical norm of explanations over a longer period of time. Each of these studies distinguish between two aspects of encouraging student explanations, offering them opportunities to give explanations and supporting students in the content of these explanations. Whilst the focus of the current paper is on identifying interactional contexts where students explain without the teacher explicitly asking them to, other teachers may replicate the situations in which these explanations arise and in doing so offer their students opportunities to explain in addition to those that may be offered through posing how and why questions. The analysis presented in this article is based on an interactional approach to classroom discourse with its roots in Ethnomethodology (Krummheuer, 2011; Sidnell & Stivers, 2014). The focus is on how teachers and students reveal their understanding of the interactional context through how they construct their turns, in terms of both the content and the structure of the turn (Margutti & Drew, 2014). Specifically, we examine interactions where students treat an explanation as being conditionally relevant to the interaction and reveal this through how they construct their turns. This enables us to identify interactional contexts where a student explanation is conditionally relevant, but where the teacher has not explicitly asked for an explanation. We use a CA approach (Sidnell & Stivers, 2014) to study sequences of turns within whole class interactions. A key principle of a CA approach is that interactions must be considered within the sequential context in which they occur, due to the reflexivity between turns. Students and teachers design their turns in response to the turns that have occurred before and their turn also forms part of the interactional context in which subsequent turns will occur (Drew, 2012). Students offer explanations in their turns when they interpret the interactional context as requiring an explanation. Whilst there has been considerable research into student explanations in response to teacher actions, including questions asked and tasks set, there is little research into the wider interactional contexts that might result in students offering explanations. This paper seeks to address this by building a collection of cases of those sequences of interaction that included student explanations, specifically when these explanations were not explicitly requested by the teacher, using this CA approach (Sidnell, 2010) and examining features of these cases in order to identify the interactional structures in which they occur. CA is an inductive and empirical approach to the study of classroom interaction (Psathas, 1995), which differs from those that dominate research within mathematics education in that it does not begin with a theoretical framework in which to analyse the data. This approach prioritises what participants themselves treat as relevant or significant. CA itself is a theoretical and methodological approach (ten Have, 2007) that is underpinned by ethnomethodological principles (Koole & Elbers, 2014; Ingram, 2018), and offers analytical tools, such as adjacency pairs and preference organisation outlined below (Schegloff, 2007), to study mathematical learning in classroom interactions. The aim of CA research is to describe and illustrate interactional phenomenon as they arise in naturally occurring situational contexts. Our analysis draws upon two key ideas from CA: conditional relevance and preference. Conditional relevance refers to the relationship of certain paired actions, called adjacency pairs, which form the focus of many CA analyses. Adjacency pairs (Schegloff, 2007) are pairs of utterances that regularly occur together in a particular order, such as questions and answers. When a question is asked, an answer is both relevant and expected (Schegloff, 2007) and this property of the adjacency pair is called conditional relevance. The prevalence of explanations following how or why questions is due to the conditional relevance of an explanation to a why or how question: when a teacher has asked someone to explain why, an explanation is expected in response. It should be recognised however that this is not the only response that could happen. Similarly, the conditionally relevant second part of an adjacency pair may be given over a series of turns or may not occur immediately after the first part of the adjacency pair (Schegloff, 2007). Thus in terms of the key ideas from CA, our broad focus in this paper is on the interactional contexts where students treat an explanation as being conditionally relevant by offering an explanation in their turn. But our specific focus is on those interactional contexts without the teacher explicitly asking a how or why question or asking explicitly for an explanation in the first part of the adjacency pair to which the students’ explanation is a response. Preference refers to the structural relationship between two adjacent turns. For example, when a teacher asks a question, the following turn usually includes an answer (an answer is conditionally relevant following the question). However, there are a variety of answers that could be given to a teacher’s question. These include, but are not limited to, the answer the teacher is anticipating, another answer, silence, or “I don’t know”. Preference describes the way that these alternatives are given and received. Preferred responses are usually given quickly (Pomerantz & Heritage, 2014) and are unmarked. They are also “noticeably absent” (Bilmes, 1988) when they are not given. A “dispreferred alternative is avoided or mitigated or delayed or, at least, accounted for” (Bilmes, 2014, p. 53) or, in other words, dispreferred responses often include some form of explanation to account for why a dispreferred response is being given. As we will illustrate below, a turn may be dispreferred because of the content of the turn or because the speaker does not have the right to speak. There can also be differences in how turns are treated by the different participants in the interaction. A student may offer an explanation, treating it as a preferred response by giving it quickly and in an unmarked way, but the teacher may treat this explanation as dispreferred in their turn that follows, by not accepting it, altering it or asking for further clarification, for example. As we go on to show, one situation where students offer explanations is when they are mitigating a response and they are treating it as dispreferred. In taking a CA approach, we seek to offer a close analysis of instances where a student offers an explanation that is not explicitly requested by the teacher. Data were collected from 17 teachers teaching mathematics in 8 different schools. All teachers volunteered to video record their mathematics lessons and chose which class to video and when to video, so the number of lessons for each teacher varied between 1 and 6, resulting in a total of 42 lessons. The teachers also chose whether to have the researcher present to video the lessons, or to video themselves, or to have a colleague video record the lesson. The analysis focuses on “everyday classroom practices” (Krummheuer, 2011) and therefore the data analysed were naturally occurring (Mondada, 2014). That is, the interactions would have taken place irrespective of the presence of a researcher or a camera, and the teachers were not given instructions about what or how to teach. The teachers are established mathematics teachers, ranging from 3 to 30 years teaching experience. The schools cover a range of school types, including both schools with above and below average proportions of students entitled to free school meals, schools with above and below average proportions of students with English as an additional language and schools with above and below average proportions of students diagnosed with special educational needs. Two fee-paying independent schools, one day school and one boarding school, were also included. Six of the schools were secondary schools taking students aged between 11 and 18 years old, one school was a middle school taking students aged between 7 and 13 and one school was a high school taking students aged between 13 and 18 years old. This diversity of classrooms enables us to look at interactional structures that occur across classrooms, teachers and schools, in a way that is consistent with an ethnomethodological approach, and are not just a specific norm for one particular teacher’s class. The whole class interactions from each video were transcribed in full using Jefferson transcription (Sidnell, 2010), though only those features of the transcription made use of in the analysis have been included in this paper. Sequences of turns that contained a student explanation were then identified as cases for further analysis. A very broad notion of explanation was taken in order to capture the union of the definitions within the literature that has already been discussed above. Unsuccessful attempts at explanations were included within the data for this paper, as the purpose of the analysis was to identify situations where students saw an explanation as being conditionally relevant, rather than whether this explanation was coherent, complete or accepted by the teacher. For example, a sequence of interaction featuring a student turn such as “because...I don’t know” would be included as it indicates an attempt to explain, although it would not be generally considered as an explanation. Indeed, all sequences of interaction featuring the connectives “so”, “because” and “then” within a student turn were included within the analysis. Other connectives such as “therefore” were also searched for but were found to occur only in teacher turns. In addition, other student turns that were longer than one word were checked to ensure that explanations without conventional connectors were not omitted, and any of these student turns without connectors that at least one of the authors considered to be an explanation was included (for example, “thirty-three” was not included, but “ten minus fifteen is minus five” was). Finally, all those sequences of interaction that featured a teacher turn that explicitly invited an explanation, such as a why or how question, or “can you explain”, were discarded. In these cases, the conditional relevance of an explanation is explicit in the content of the turns, as the teacher has specifically asked for one. The cases that remain following this sifting process are of interest because they occur when the student treats the situation as one where an explanation is conditionally relevant, even though the teacher has not explicitly asked them to explain. To ease the reading of the transcriptions, the teachers have all been given pseudonyms beginning with the letter T, and the students have all been given pseudonyms beginning with the letter S. Where it is not possible to uniquely identify which student is talking, we have used the label student. Two interactional contexts that students treat an explanation as being conditionally relevant without being explicitly asked for one were identified. The first context arises when the student is offering a response to a question that has already been answered. This could be offering a different answer to the question, adding to the answer already given, or defending an answer they had previously given. The second context arises when the student speaks when they do not have the “right” to the turn (Mchoul, 1978). These contexts are not mutually exclusive and students may be orienting to more than one feature of the interactional context when they give their turn, for example a student can simultaneously offer a different answer and take a turn they have not been invited to take. Although the teachers have not explicitly asked for an explanation, these interactional structures may have been consciously used by the teachers involved, and they may be part of the norms (Yackel & Cobb, 1996) of those classrooms. The role of CA analysis is to describe and illustrate these interactional structures and claims around teachers’ intentions or awareness cannot be made unless the teacher makes these explicit in the interaction. Our intention is that this description and illustration of the interactional structures will enable them to be used intentionally by teachers to support students in giving explanations. Each extract is included to illustrate the particular features of the interactional structures that include the student explanations of interest. Students can include explanations in their turns when they are answering questions that have already been answered. In the first three extracts that follow, the teacher has not explicitly asked for an explanation when they have asked the initial question, yet in the sequence that follows, students include explanations in their turns. In most cases, the first student who responds to the teacher’s question does not include an explanation in their turn, it is in subsequent student responses that these explanations appear. In Extract 1, the teacher asks “what the mode, median, the mean, and the range are” for a set of data presented in a frequency table, but does not ask for an explanation or how students calculated each of these. Sam, the first student to answer offers an incorrect response of the range being 117 in line 70 (not included in the extract). The teacher’s turn that follows implicitly indicates Sam’s response is incorrect through how lines 74 to 78 are structured and phrased, but does not explicitly evaluate Sam’s (incorrect) response of 117. Thomas begins by repeating Sam’s response, mimicking the prosody and structure. This would usually indicate acceptance of a response (Hellermann, 2003) and would also usually be followed by the teacher moving the interaction on. Instead, Thomas expands on Sam’s response, at first outlining the general procedure for calculating the range. Thomas then substitutes the same (incorrect) values that Sam appears to have used into the formula for the range. This overall description of the procedure includes several pauses, including a long pause of 1.6 s before the teacher nominates another student, Simon, to speak. Thomas’ turn does not include a new question or any other type of initiation that requires a response, and has not explicitly included a request for an explanation in the responses that follow. Simon is also answering the original question that was answered by Sam, but is offering a different, contradictory (and correct) response. This turn begins with a negative evaluation followed by an explanation of where the new answer comes from, before the new answer is given. Disagreeing (and in particular negatively evaluating student answers (Ingram, Pitt, & Baldry, 2015)) is a dispreferred response which is a disaffiliative action that needs accounting for (Heritage & Raymond, 2005), which Simon has done by offering an explanation. This explanation focuses on where the new values that are to be substituted into the formula for the range have come from, rather than why the first answer is incorrect, minimising the disaffiliative nature of the turn. Extract 2 illustrates another situation where a student offers an explanation when giving a contrasting answer to an earlier response to the same question from another student. Here, the teacher, Tim, poses a question to the class as a whole, without specifically nominating a student to answer. Rules of turn-taking in the classroom (Mchoul, 1978) do not apply, and instead students are able to speak freely without being specifically nominated by the teacher. This situation makes transcription challenging, but three distinct student voices are heard (those of Sarah, Sacha and Steven) and the other student voices are not attributed to individuals. Over the first few turns several students offer responses resulting in three different answers: 1 h, 2 h, and it is a trick question. The question asked by Tim in lines 207–208 is closed and does not explicitly ask for an explanation. The first explanation offered is Sacha’s in line 216, but until line 225 all the other student responses answer the question asked in lines 207–208 and do not include explanations. Tim repeats one of these answers in line 220. Later, lines 225 and 230, 236, 237–208, 240 and 244–245 all indicate that in the context of this interaction, students are treating an explanation as conditionally relevant. In lines 225 and 230, Steven indicates that he interprets the situation as needing an explanation by including the connective “because”, even though in these turns he does not give one successfully. In line 236, Sarah is giving an answer that is different from Steven’s in 218 (continued in line 230) and different from the answer repeated by Tim in line 220. Again, Sarah interprets the situation as one where an explanation, which she includes at the end of her turn and adds in line 240, is conditionally relevant. These turns are followed by two other students giving explanations in lines 237 and 244 before the interaction is concluded. Again, the students are explicitly disagreeing with each other, with four explicit negative evaluations in lines 221, 233, 235 and 240. Each of these successful explanations serve to mitigate the disaffiliative action of disagreeing and are given after an answer that differs from their own. Each offers an account for why they are disagreeing, for why their answer of 2 h is correct, and not for why the other answers are incorrect, again minimising the disaffiliative action within their turns. Thus, the explanations focus on defending the alternative answer given by the student, rather than critiquing the answer given by another student (Ingram, Andrews, & Pitt, 2018a). In the two preceding examples, the students who include, or attempt to include, explanations in their turns are disagreeing with answers to the teachers’ original questions that other students have given previously. Explanations also arise when the students are offering additional answers that are not necessarily contradictory. In Extract 3, the class have been working on a question where the teacher has given the students four numbers and has asked then to find the fifth number needed for the numbers to have an average of 70, but without specifying which average. The interaction so far has only considered the mean and this is what the teacher Thomas and Sadiq are discussing in lines 43–57. In lines 42 and 59–60, Sonia is suggesting an alternative answer of 71. In his turns that follow, Thomas treats this alternative answer as a deviation from the current topic of the interaction. In line 43, Thomas interrupts Sonia and quickly moves the interaction back to the calculation of the mean. In line 61 again, Thomas interrupts Sonia and returns the interaction back to the calculation of the mean, but with an indication that he will return to Sonia’s response later in the interaction. In line 42, Sonia does not have the right to speak (Mchoul, 1978) as Thomas is in the middle of his explanation and has not invited her to speak. 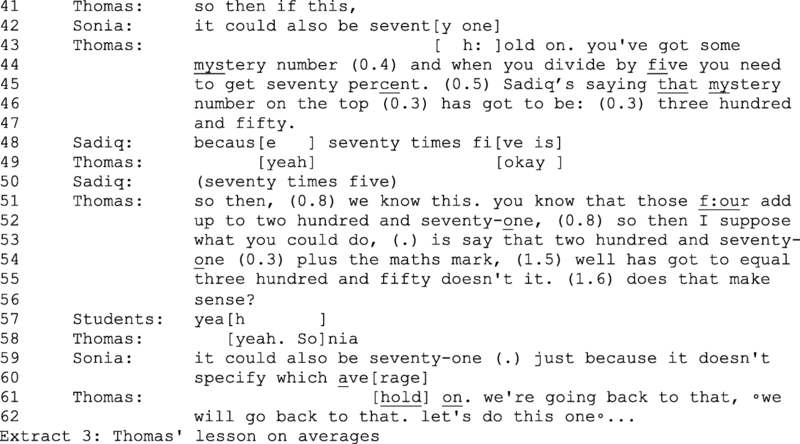 Sonia’s turn in lines 59–60, where she has been given the turn by Thomas, includes an explanation for why her answer is valid and accounts for the deviation from the topic of the interaction, indicating that she is offering a different average. This answer of 71 is returned to later in the interaction after the class have successfully calculated the missing value that would give a mean mark of 70%. The explanation Sonia gives offers an account which both minimises the dispreferred deviation from the topic of the interaction at the time, as well as the attempts to speak when she does not have the right to a turn as the teacher is speaking. The examples offered so far draw largely upon the content of the interaction, in that they illustrate how students offer explanations when they are answering a question that has already been answered. There are other aspects of the structure of the interaction itself which can also result in the students offering an explanation, the structure of turn-taking (Mchoul, 1978; Ingram & Elliott, 2016). Extract 3 illustrated a context where the student is both speaking out of turn and answering a question that has already been answered, giving an answer that is different but one that does not contradict or imply that the previously given answer by another student is incorrect. In Extract 4, the students have been given a collection of cards with probability scenarios written on them and have to decide in groups whether the claim made on the card was true or false. Card E that Tamsin refers to in line 235 states that the outcomes of a football match are win, lose or draw; therefore, the probability of a draw is 1/3. Shaun is nominated by Tamsin in line 235 to say whether the claim on the card is true or false and responds in line 236. Meanwhile in line 237, another student, Scott, from the same group also answers the question, with the same answer, but adds an explanation. In line 237, Scott does not have the right to speak as he has not been nominated by Tamsin, and this is treated as a source of trouble by the students in the subsequent turns. Scott gives the same answer as the one given by Shaun in line 236, so is both speaking out of turn and answering a question that has already been answered. Scott then offers an account for his own answer by adding an explanation within this turn which is continued in line 240. 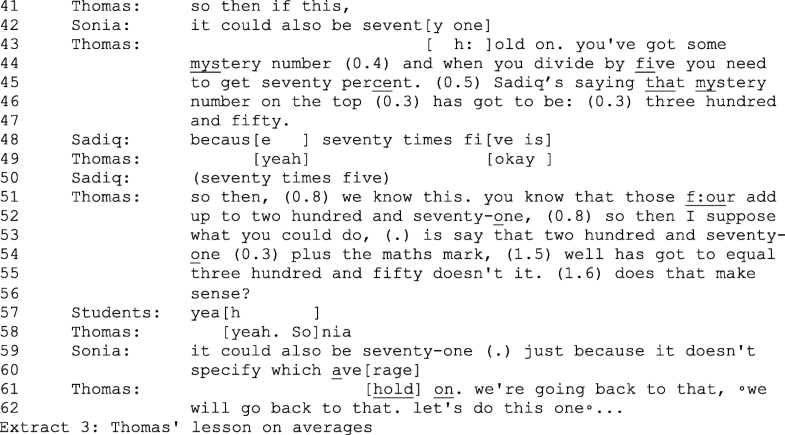 Tamsin invites Scott to continue his explanation in line 249, but Scott does not initially take up this opportunity as the invitation is followed by a pause of 1.8 s before Tamsin repeats the explanation already given. Scott then adds another reason for why the answer is a third before the interaction is concluded. The lesson ends without the incorrectness of this explanation being discussed. The context of speaking out of turn can coincide with the context of a student answering a question that has already been answered, including contexts where they are disagreeing with a previously given answer. In Extract 3, Sonia also did not have the right to speak until line 59 and the teacher overlaps her attempts to take the turn, and also asks her to wait until he gives her the turn, demonstrating that Thomas is orienting to the rules of turn-taking. In contrast, in Extract 4, the teacher does not prevent Scott from explaining and does not treat this turn as dispreferred even though it deviates from the usual rules of turn-taking (Ingram & Elliott, 2014; Mchoul, 1978). It is only the students that treat this speaking out of turn as problematic. Although mathematically, the claim that the probability is 1/3 as there are three possible (but not stated as equally likely) outcomes is questionable, interestingly the disaffliatve nature of Scott’s turn in line 237 comes from speaking out of turn, rather than the content of the turn, which is affiliative in that it agrees with Shaun’s answer that precedes it. It is consequently the deviation from the structure of turn-taking that makes an account or explanation conditionally relevant, and not the disaffliative nature of the content of the turn. This is further supported by situations where the students agree with previously given answers and where the rules of turn-taking are not oriented to by the teacher or the students, but no accompanying explanation is given. In this paper, we have examined interactional contexts where students have treated an explanation as being conditionally relevant. In doing so, we have sought to address the methodological issues of what counts as an explanation highlighted in the literature. As to the question of when they occur, we have focused on those explanations that have not directly followed a teacher’s explicit request for an explanation. Whilst we recognise that such situations are rare within our data, two interactional contexts were identified where the students treated an explanation as being conditionally relevant. The first context relates specifically to the content of the students’ turns, in that, they were answering a question that had already been answered, whether that was to give a different answer, build on a previous answer, or defend an explanation they had given earlier. The other interactional context where an explanation was given was when students spoke when they did not have the right to speak. In each case, the students’ explanation was conditionally relevant because of the preference organisation of the interaction that preceded it. The explanations served as an account for the student’s disaffiliative action of giving a turn that would be dispreferred. These disaffiliative actions include offering answers that differ from answers that have already been given and speaking out of turn. By making these structures explicit, we are making them available to teachers to use in their own classrooms, whilst recognising the implications of this need further research and careful consideration. We wish to expand on these implications further here. Whilst the interactional contexts we have discussed are co-constructed by the teacher and the students, in many of these contexts the task offered by the teacher was designed such that more than one answer was possible or likely to be given. The most common of these were questions that often reveal a common misconception or mistake that students make, such as in Extracts 1, 2 or 4. The question in itself did not make these explanations conditionally relevant, but rather the other students’ responses to this question, since the explanations accompanied an additional or contrasting answer. The need for these explanations arose from students justifying or defending their answers. In identifying this effect, we are highlighting the use of tasks or questions where more than one answer is possible or likely to be given, in addition to why and how questions as a strategy that teachers could use to offer students the opportunity to give mathematical explanations. An example of one teacher using this first interactional context after being made aware of it by the authors is given in Ingram, Andrews, and Pitt (2018b). The contexts identified also involve the structure of turn-taking in the mathematics classroom. In two of the extracts, the student has spoken when they do not have the right to speak, and in Extract 2, the usual rules for turn-taking in classrooms are not being followed. There are also deviations from the usual rules for turn-taking (Mchoul, 1978) in each of the other extracts that often allowed for the different, and sometimes contrasting, answers to arise. These deviations from the usual rules of turn-taking often are associated with tasks that involve argumentation and debate, and rely on the teachers giving up some of the usual control they have in classroom interaction (Ingram & Elliott, 2016). Some teachers, it should be acknowledged, might not be comfortable or confident enough to intentionally generate this sort of debate, and this loss of control over turn-taking may have different effects with different classes. These interactional contexts also have implications for teacher subject knowledge. Firstly, in order to generate the type of debate where students feel the need to explain their answers, teachers need to be aware of the type of questions and tasks that could generate this sort of debate. There are then also challenges in responding in appropriate and effective ways to what they see and interpret in students’ activity (Doerr, 2006), as the conclusion of the debate may not always be the conclusion that would be accepted by the wider mathematical community (as in Extract 4). Research has pointed to some of the challenges and difficulties inherent in the tasks of listening and responding to students’ thinking (e.g. Doerr, 2006). There are additional issues in that teachers have difficulty understanding and valuing student explanations that deviate from what they were anticipating (Morgan & Watson, 2002). As Leinhardt argues, the “degree to which a teacher understands and is aware of these subtleties within the domain of mathematics dramatically affects his or her ability…to lead an explanation of a particular mathematical idea” (2001, p. 343). Our analysis also suggests that the focus of a teacher’s attention should be both on the mathematical content of a student’s explanation and also on its action. For when a dispreferred response is offered by a student with an explanation, this explanation is often serving a dual purpose: as a social action mitigating the deviation from the normal structure of the interaction, and as a mathematical justification of the student’s initial response. If the teacher’s attention is more focused on the first of these, then the mathematical justification is in the background and risks becoming background “noise”. Thus the teachers’ capacity to respond in the moment to a mathematical explanation is not solely a function of their subject knowledge, but may also be constrained by what they are attending to in the moment. The ability of students to give mathematical explanations is an important goal of mathematics teaching. The nature of such explanations and ways in which teachers can support and extend the quality of students’ mathematical explanations are areas for possible future consideration. However, students first need opportunities to give explanations. Teachers have a variety of ways of encouraging such explanations, for example through skilful questioning, carefully chosen tasks and well-managed group activities. In this paper, we have offered further, less explicit but more contingent, ways in which a teacher can generate the need for an explanation. Transcription Notation (from Sidnell, 2010). Indicates the start and end points of overlapping speech. Indicates the length, in seconds, of a silence. A hearable pause, usually less than 0.2 s.
Indicates falling pitch or intonation. Indicates rising pitch or intonation. Indicates a temporary rise or fall in intonation. Indicates an abrupt halt or interruption in utterance. Indicates the speaker is emphasising or stressing the speech. Indicates prolongation of a sound. Speech which is unclear in the transcript. The work discussed in this paper was partly supported by the John Fell Fund. Erath, K. (2016). How can teachers provide learning opportunities for oral explanations. 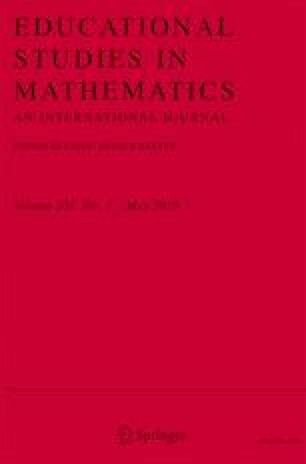 Paper presented at the 13th International Congress of Mathematical Education. Hamburg. Retrieved from http://www.mathematik.tu-dortmund.de/kerath/Erath_2016_ICME_learning_opportunities.pdf. Accessed 6 Feb 2018.